Guess who peed in the potty yesterday?! Ali has been really curious about the whole bathroom process so we’ve been explaining to her how it works for the past couple of months. She’s not quite 18 months old and we weren’t planning on even introducing the potty seat until then. Since Ali got an Amazon gift card for Christmas, I went ahead and ordered the Prince Lionheart WeePOD seat attachment I had researched. One day after she was watching me go, I said “when you get bigger you can go pee in the potty, too.” She immediately tried to climb onto the toilet and I realized she may be ready to try this sooner than we thought. So here we are, after about 10x of practice/pretending on the seat, yesterday she told Jason “poop” and wanted to get on the potty. He put her up there and what do you know? She passed some gas and then peed! I don’t think she’s physically ready to be fully potty trained just yet (to be able to know and communicate that she has to go, and to be able to hold it until she gets to the potty…) however, we’re excited that she’s so interested and determined that she’s going to go how we go. This entry was posted on Tuesday, January 15th, 2013 at 11:32 am and is filed under Family, Family: Precious/Ali. You can follow any responses to this entry through the RSS 2.0 feed. You can skip to the end and leave a response. Pinging is currently not allowed. Break out the M&M’s! 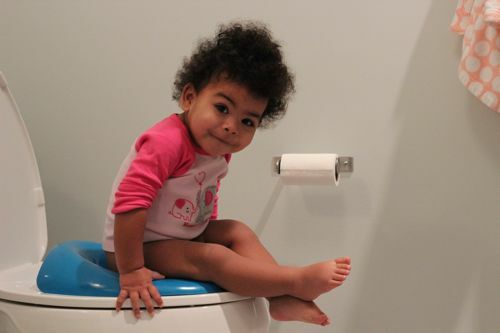 Pumpkin was potty trained at 18 months. And we started on Honey as soon as we got her. It can happen!! Way to go Ali girl! Schedule times to just put her on everyday at the same time (waking, before eating, etc) and just let her get in some practice! We did pull-ups for a while because she couldn’t tell us all the time and I wasn’t ready to just be cleaning up pee all over the place. But later we realized she was ready and the pull-ups were making her lazy. So off came the pull-ups and I had to wash like 10 outfits a day for about two days (slight exaggeration) but that number quickly went down and it didn’t take long once she was ready. You’ll know when it is time to go all out – until then make it fun!